There’s the country blues, and there’s the city blues. And as Daytona Beach–based blues musician Mark Hodgson sang at a recent performance at a DeLand roadhouse, “Sometimes I get the blues I can’t even use.” But considering Hodgson’s recent productivity, he’s easily found countless uses for the blues. The most recent project of the forty-something guitarist, singer and harmonica player is called hblues.com. And even though the group comprises down-to-earth, been-there/done-that industry veterans and local top-shelf session talent, the musical focus is out of this world. “I’m not interested in doing it like everybody else,” Hodgson states. Hblues.com certainly isn’t, as he describes, “cats in hats with Strats.” With roots in traditional and modern blues, jazz, avant-garde, and R&B, how does it all come together? “I take traditional ideas and convert them, steal things, and add them to [my] own,” Hodgson says. That’s how music progresses: Led Zeppelin and the Rolling Stones stole licks from Muddy Waters and Howlin’ Wolf, who themselves were influenced by earlier musicians. It’s an authentic homage rather than heartless appropriation. The musicians in hblues.com bring together years of experience. Hodgson began blowing on the harmonica thirty years ago, picked up the guitar soon after and sings with a throaty voice reminiscent of Howlin’ Wolf. The backbeat of the group is renowned percussionist Michael Welch, a high-profile player in the Orlando improvisation scene. He’s played with British guitarist Derek Bailey, Australian violinist Jon Rose, and Orlando’s own Sam Rivers for the highbrow Civic Minded Five series. In hblues.com, Welch applies the Q4T, his odd quadragrip style that involves drumming on a customized trap set of traditional and nontraditional pieces, while wielding two drum sticks in each hand. Though he uses a stripped-down kit, Welch still provides dense Afro-Cuban and polyrhythmic beats to the otherwise straightforward blues. And for certain songs, Welch lays down a simple groove for Hodgson and the other musicians to improvise over as well as to experiment with time signatures that are decidedly not traditional twelve-bar blues. 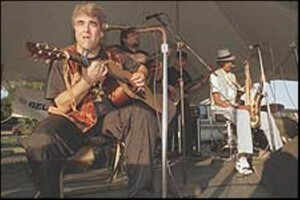 Guitarist Rich Walker, of the nine-piece Rich Walker Blues Band, plays smooth lines to Hodgson’s furious strumming and harmonica playing. With a fat, hollow-bodied guitar, his refined execution recalls jazz. The seventy-something tenor saxophonist Noble “Thin Man” Watts brings the rhythm ‘n’ blues perspective to Hodgson’s straightforward blues. (Perhaps it’s long overdue, but the DeLand native will receive an honorary degree from Stetson University in May.) Rounding out the storied lineup is Steven Dees, a primary bassist for many local projects. Hblues.com also serves as the website address for a loosely knit collective of blues-based musicians called Ambient Blues Group of Artists, which incorporates a record label and a recording/production company. For now, the group tunes up every Wednesday at Smokin’ Cellar and regularly at OB’s, both in DeLand. They’re after more outdoor shows and other opportunities to avoid smoke-filled (and alcohol-fueled) bars. Recently, they played the Lincoln Park Blues Festival in St. Augustine as well as a sold-out Peabody Auditorium in Daytona Beach. A five-day Thanksgiving holiday stint at House of Blues brings the blues family triumphantly back, at least metaphorically, to the juke-joint atmosphere in which the blues evolved. Live, the conceptually oriented project runs the gamut of blues music from this century: field hollers and country blues from the turn of the century, to the harmonica rage of the ‘20s, to acoustic-based Delta-style, to electric bands of midcentury, to a nine-piece blowout. As for CDs, much of hblues.com’s music has been recorded. Due before Christmas on the Ambient Blues Group label is Hodgson and Welch’s Garage Set (Delta blues mixed with spoken word), a CD sampler of the Peabody revue called All the Best, plus a solo outing from Hodgson. As always, Hodgson hopes to garner major-label interest in the Ambient Blues projects, but for a man used to doing things his way, it’s only the music that matters in the end. But really Hodgson has been DIY from the start. Entertaining tourist crowds in Daytona Beach for a decades, he’s used to the appreciative yet transient attachment people have for his music. For years, he’s released his own records and CDs as souvenirs for his six-night-a-week gigs. “I did it when nobody was thinking about it. It was just practical.” In the music biz, it’s called paying your dues. “We’ve all been at it for a long time. We’re just hard-hitting guys, you know?” Hodgson says. “For one reason or another I always fell between the cracks. If something was ‘in,’ I was doing something else.” Still, only a few bluesmen, such as Buddy Guy and B. B. King, have grown into household names.